Cut the chicken breasts in half crosswise. Wash and dry the citrus fruit. Using a mandoline slicer, slice them between 1/4 and 1/8 inch thick. Remove any seeds. Note: I used all the lemon, but only about half of the other fruits. Line a baking sheet (the kind with sides) with parchment paper or foil. Set down a few slices of the fruit, and then lay out your chicken pieces, making sure not to crowd the pan. if you are making extra, use another pan rather than crowd the chicken. Whisk together the sauce ingredients and brush it onto each piece of chicken. 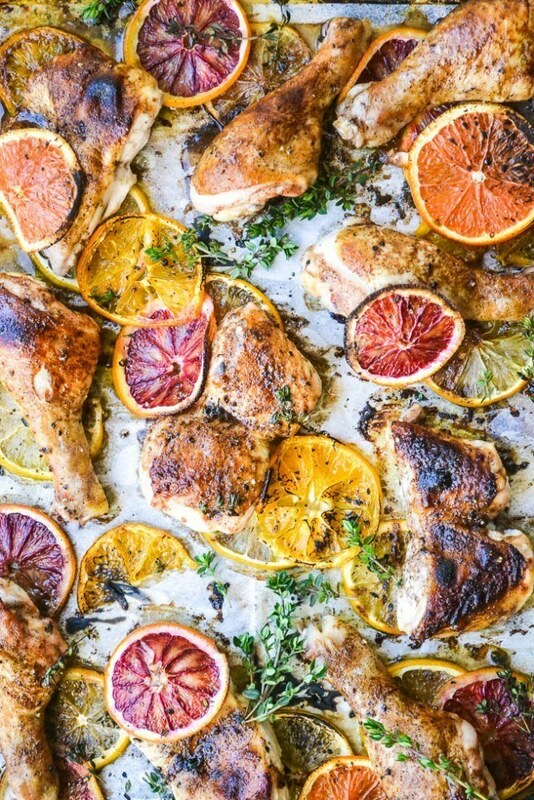 Arrange slices of citrus around the chicken. You may not need all the slices. Shower everything with a little bit of sea salt and some fresh cracked black pepper. Roast for about 35 minutes. I baste the chicken a couple of times with more sauce. Serve with more fresh thyme.